Perseus and its prominent star Algol, the Demon, will pass directly overhead this week. 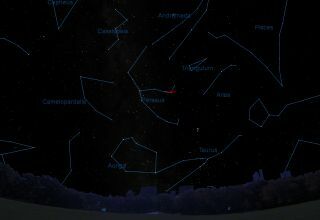 This week, between 11 p.m. and midnight local time, the constellation immortalizing one of the greatest heroes of Greek mythology — Perseus — will pass directly overhead. Its prominent variable star, Algol — known as "the Demon" — will be vividly visible as well. Later, when flying over the seacoast of Ethiopia with his winged sandals, he noticed the beautiful princess Andromeda, who was chained to a rock in the sea, and the monster Cetus hungrily approaching the rock. Perseus was still carrying the head of Medusa, and in the end, he simply held it up in front of the sea monster, turning Cetus into stone. Having dispatched the monster, Andromeda and Perseus were married and presumably lived happily ever after. In the sky, Perseus is a pattern of stars that can be visualized in different ways. Some see it as a large, starry arrowhead that points upward along the Milky Way toward the distinctive "W" of Cassiopeia. Others might see him resembling a lopsided letter "K" with the downward side of the "K" pointing to the Pleiades, and the upward arm ending with the star Algol, the Demon, a famous prototype variable star. Its name derives from Ra's al-Ghul, which is Arabic for "the demon's head," according to the late star-name expert George A. Davis Jr.
Just like the brilliant summer star Vega passes directly overhead for Washington, D.C., so too does the Demon pass directly overhead for New York City. Although we call Algol a variable star, it does not intrinsically brighten and dim, because it expands and contracts (like the star Mira). Rather, its light changes as one binary-star component eclipses another, because their orbital plane lies nearly in our line of sight. Algol is about 90 light-years away. The two components are about the same size but are unequal in luminosity: The slightly smaller, blue star is about 90 times as luminous as the sun and brighter than its orange companion, and when it passes behind the dimmer star, the total light of the system fades greatly. The orange star is "dim" only in comparison to the bright star; it gives off about three times the sun's light. Ever since the late 18th century, much attention has been paid to Algol, which normally shines at magnitude 2.1 (almost as bright as Polaris, the North Star) but, with regularity, every 2.867 days fades to about magnitude 3.4 (one-third as bright) and then recovers in about 10 hours. Algol has a long and venerable history. It's the most prominent eclipsing variable star in the sky and the first discovered. The astronomer who first noticed Algol's fade-downs was Geminiano Montanari of Bologna, Italy, who noticed the effect around 1667. At that time, the only other variable star known was Mira, whose light varies over months instead of hours. Perhaps this is why few other astronomers paid much attention to Montanari's discovery. Algol's variability was rediscovered in 1782 by an 18-year-old English amateur astronomer named John Goodricke. He observed the star systematically to determine its period and correctly suggested the reason for the variations: A dim body orbits the star, periodically blocking some of its light from view. In the table below are predictions of when Algol will shine at minimum brightness (mid-eclipse) this week. Though each primary eclipse lasts about 9 hours, 40 minutes as the star fades from magnitude 2.1 to magnitude 3.4 and recovers, most of the light change takes place from about three hours before to three hours after mid-minimum; it's at minimum for only 10 or 12 minutes. Unfortunately, the November mid-minima that occur at convenient nighttime hours (such as 9:21 p.m. PST on Nov. 24 and 9:10 p.m. EST on Nov. 27) happen when the moon is nearly full. Nevertheless, naked-eye and binocular observers can still watch Algol dim and recover. Although the first definitive observation of Algol's variation in brightness was by Montanari in 1667, was he really the first to discover it? For many centuries prior to Montanari, Algol represented one of Medusa's eyes as Perseus held her head aloft in the allegorical outline of the constellation. The literal translation of Algol is "the mischievous one." And ancient and medieval astrologers considered Algol the most dangerous and unfortunate star in the heavens. So, was Algol's strange variability noticed in antiquity? "This reasonable conjecture remains unsupported by any other real evidence," Robert Burnham Jr. noted in his "Celestial Handbook." On the other hand, a paper published in 2013 in The Astrophysical Journal suggested that an Egyptian calendar for lucky and unlucky days 32 centuries ago featured a distinct periodicity of 2.85 days, suggesting that this periodicity might indeed be connected to Algol.